Strain distribution εxx (horizontal) at three drilling depths of 0.2mm (left), 0.4mm (centre) and after 1mm (right); FoV: 8,4mm x 7mm; Drilling diameter: 1,8mm; Arrows: direction of principal strain ε2. The hole drilling method in combination with strain gauges is an established method for residual stress analysis in metal materials. In contrast a full-field and non-contact measurement using VIC-3D is especially advantageous in order to quantify the non-homogeneous residual strains and stresses within composite structures. 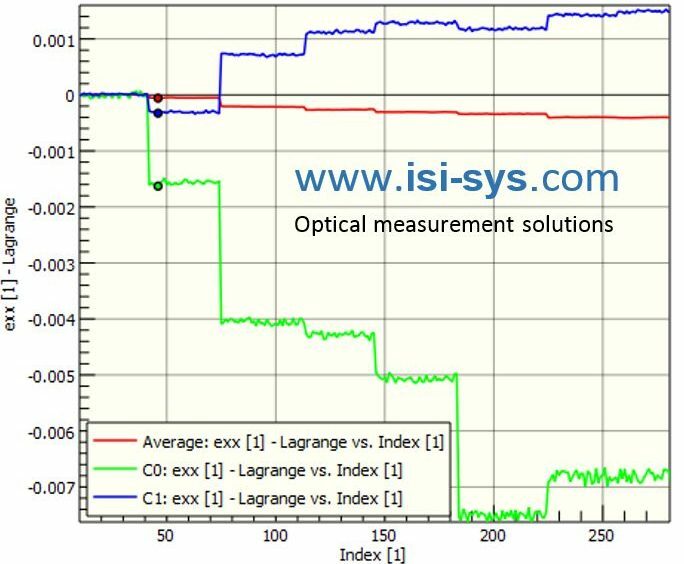 The example above shows the strain measurement εxx of a carbon composite at different drilling depths. The right image is superposed with an FEM model of a quarter section. 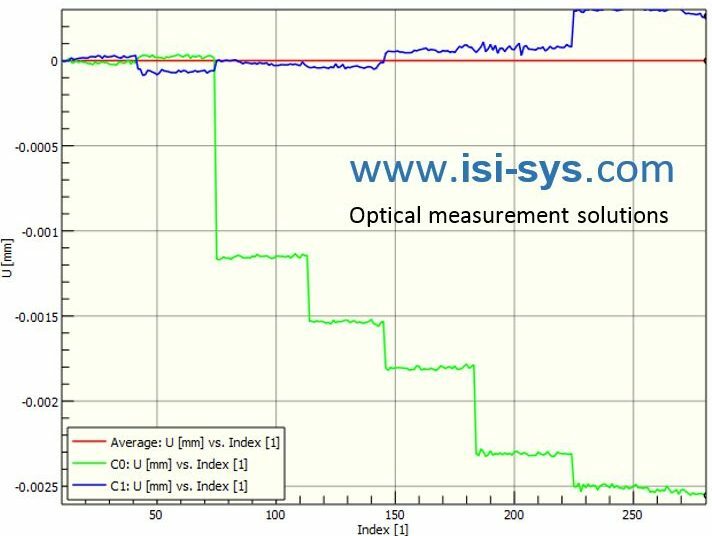 isi-sys offers a turn-key solution for residual stress analysis according to the hole drilling method in combination with a special version of the 3D Micro DIC stereo sensor. The images below show the deformations (U, V, W) of the carbon fibre composite at 1mm drilling depth corresponding to the strain measurement above. The examples show the measured deformation and strain close to the drilled hole with high spatial resolution, even at very small diameters (2.3mm down to 0.8mm). This is possible as the stereo sensor set-up is designed for a FOV of about 8.4mm x 7mm @ 5Mpx. This is hardly resolvable using the strain gauge principle. The residual strain analysis system is equipped with a special drill, operating with around 100.000 to 300.000 RPM. The special version of the 3D Micro DIC sensor allows to drill and measure without repositioning of the drill or the sensor. Deformations (U, V, W) at 1mm drilling depth within carbon composite measured by the Strainography sensor; FoV 8,4 mm x 7mm; Drilling diamter 1,8mm; Arrows: direction of the principal strain ε2.